XML Signature 2.0. Timelines 2002 – XML Signature 1.0 2007 – XML Signature 1.0, 2 nd edition –Adds support for Canonicalization 2009 end – XML Signature. 2 Timelines 2002 – XML Signature 1.0 2007 – XML Signature 1.0, 2 nd edition –Adds support for Canonicalization 2009 end – XML Signature 1.1 –Adds support for Elliptic Curve algorithms required for Suite B –SHA2 algorithms, DER format for keys, OCSP Response and few other things 2010 mid – XML Signature 2.0 –Major changes – discussed in rest of presentation. 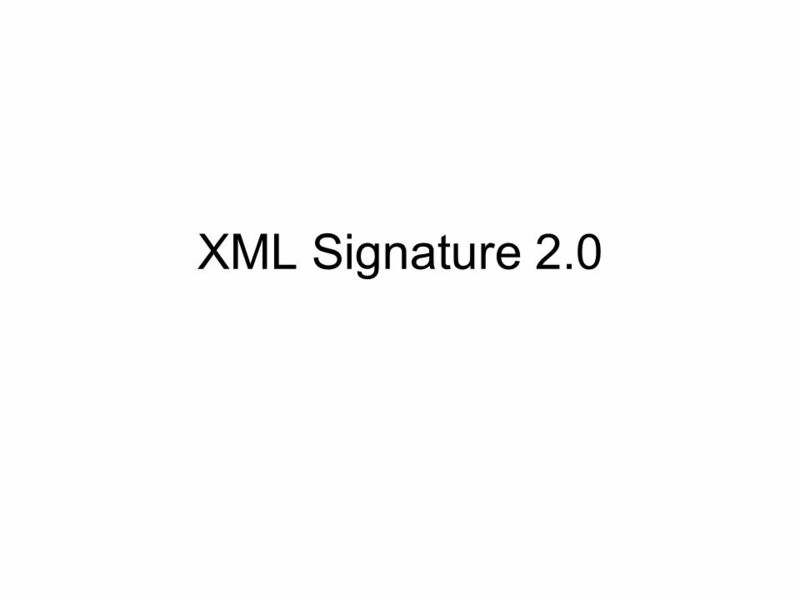 –The first draft of XML Signature 2.0 is out, and it now open for public review. 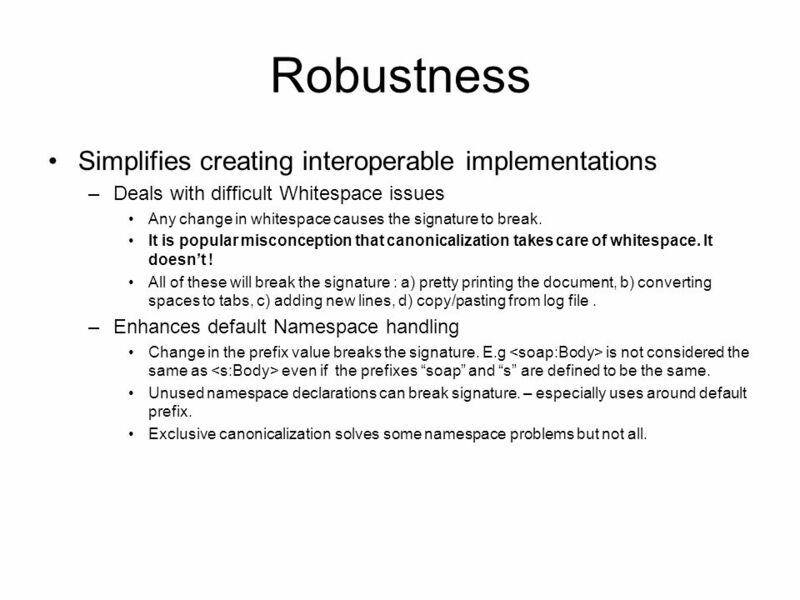 4 Robustness Simplifies creating interoperable implementations –Deals with difficult Whitespace issues Any change in whitespace causes the signature to break. It is popular misconception that canonicalization takes care of whitespace. It doesnt ! All of these will break the signature : a) pretty printing the document, b) converting spaces to tabs, c) adding new lines, d) copy/pasting from log file. –Enhances default Namespace handling Change in the prefix value breaks the signature. E.g is not considered the same as even if the prefixes soap and s are defined to be the same. Unused namespace declarations can break signature. – especially uses around default prefix. Exclusive canonicalization solves some namespace problems but not all. 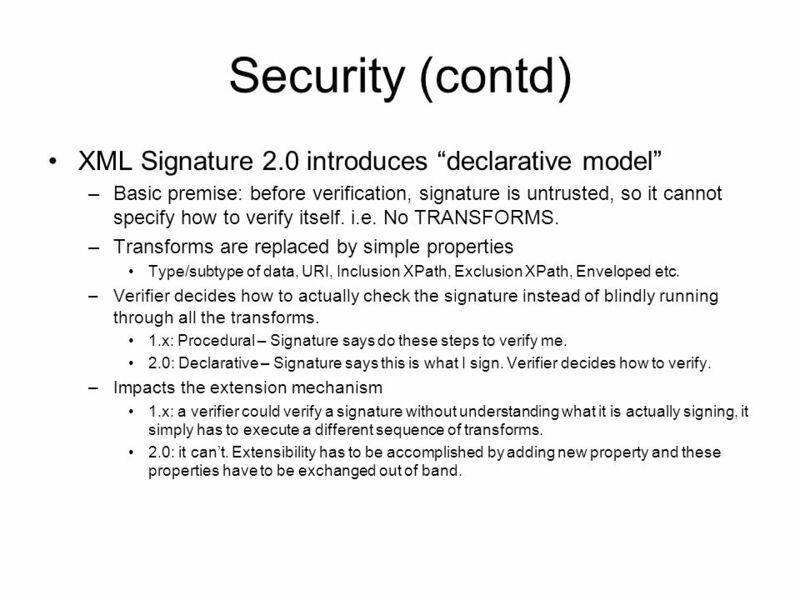 8 Security (contd) XML Signature 2.0 introduces declarative model –Basic premise: before verification, signature is untrusted, so it cannot specify how to verify itself. i.e. No TRANSFORMS. –Transforms are replaced by simple properties Type/subtype of data, URI, Inclusion XPath, Exclusion XPath, Enveloped etc. –Verifier decides how to actually check the signature instead of blindly running through all the transforms. 1.x: Procedural – Signature says do these steps to verify me. 2.0: Declarative – Signature says this is what I sign. Verifier decides how to verify. –Impacts the extension mechanism 1.x: a verifier could verify a signature without understanding what it is actually signing, it simply has to execute a different sequence of transforms. 2.0: it cant. Extensibility has to be accomplished by adding new property and these properties have to be exchanged out of band. 9 Security (contd) XML signature 2.0 eliminates DoS attacks involving loops –Since there are no transforms, the DoS attack of a Signature having 10,000 transforms is not possible any more. –The n 2 attack with namespace nodes is eliminated, because nodeset is not used any more. (Suppose an incoming message has n elements and n namespaces, i.e. total 2n nodes. XML Signature 1.x will expand this out to n 2 nodes. This is exploited in many DoS attacks). –Another n 2 attack with XPath transform is eliminated too, because in XML Signature 2.0, the Included XPath and exluded Xpath is executed only once, not once per node. (suppose an incoming message has n elements. It is easy to contruct an XPath expression that iterates through all the nodes. Since XPath transforms XPath is executed for every node, this would result in n 2 traversals). –An XPath Filter 2 Transform, could have thousands of Intesect/Union/Subtract XPaths. But in signature 2.0 there are only two include and exclude. –Loops in XSLT are also eliminated because XSLT is disallowed completely. 10 Security (contd) XML Signature 2.0 eliminates the XSLT transform –XSLT can be exploited for many kinds of attacks. –e.g. an XSLT transform can execute code to shutdown the system –e.g. an XSLT transform can run a very large loop causing a Dos attack XML Signature 2.0 also removes the Decrypt Transform –The decrypt transform enabled signatures to be verified even if the order of the operations Sign and Encrypt operations is not known. In all real uses cases the order of operations is known beforehand, e.g. through a Policy, so decrypt transform is not used in practice. The other bigger issue is that during decryption there is no check done of what key was used to encrypt the data, what was the strength of the algorithm used to encrypt it etc, decryption just happens as a side effect. This means it insecure. Decrypt transform also has a performance impact, because after the decryption transform the decrypted data is just passed to the next transform, they are not stored anywhere, So decryption needs to be repeated. 12 Streaming Streaming is major goal for XML Signature 2.0 –It should be possible to sign/verify without loading the whole document in memory Currently web services prefer to work in streaming mode. But many implementations end up converting to DOM just to execute sign/verify operations. This has a very high overhead. Estimate that streaming will give a 2x-4x boost on software. For Hardware devices streaming is an absolute most. Most current implementation work with only the subset of XML signature that can be streamed. –The biggest impediment to streaming was XPath. 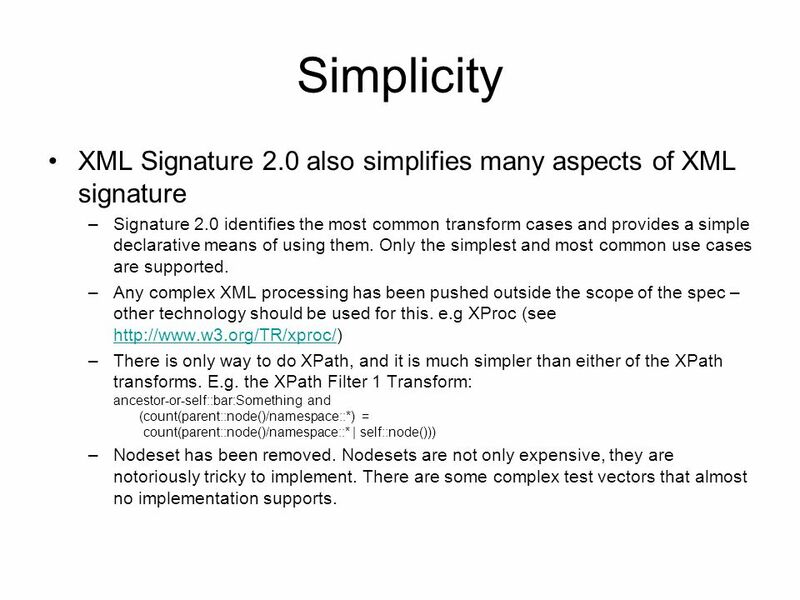 XML Signature 2.0 describes all operations in terms of subtrees instead of XPath nodesets. Nodesets are by definition not streamable. 2.0 also defines a streamable subset of XPath, only XPaths in this subset are allowed. –Note: Streaming does not necessarily imply only one pass. In WS-Security the signature is before the data that is being signed, so obviously one needs to make a second pass to update the signature value. 13 Performance XML Signature 2.0 has performance improvements for the non streaming implementations too. –Canonicalization can be implemented by simple tree walk instead of iterating over nodeset. The performance of canonicalization should be same as XML serialization. If you follow the 1.x spec exactly it would be extremely slow. Most mature implementations already do a tree walk, instead of following the spec exactly. So really the spec will be updated to what some implementations are already doing. –Does not do a namespace node expansion XML Signature 1.x is based on the XPath data model, in which namespace nodes are expanded out – this can result in very high memory usage. E.g. if there are O(n) elements and O(m) namespaces, it would use O(n * m) memory. With the new approach it only uses O(n + m). (Again some implementations are already doing this internally. –Does not evaluate XPath multiple times XPath evaluation is expensive, and in XPath Filter Transform, the XPath needs to be evaluated for every node. XPath Filter 2 Transform solves this problem, but it was not popular as many implementations do not support it, also it has nodeset and namespace issues mentioned above. Signature 2.0 has a very simplified XPath model. –Does not to automatic nodeset -> binary -> nodeset conversion In XML Signature 1.x, the transform processing is supposed to do these expensive operations whenever there is an impedance mismatch between one transforms output and the next ones input. They are no longer applicable for 2.0 –Recommends combining canonicalization and digesting operations. 14 Simplicity XML Signature 2.0 also simplifies many aspects of XML signature –Signature 2.0 identifies the most common transform cases and provides a simple declarative means of using them. Only the simplest and most common use cases are supported. –Any complex XML processing has been pushed outside the scope of the spec – other technology should be used for this. e.g XProc (see http://www.w3.org/TR/xproc/) http://www.w3.org/TR/xproc/ –There is only way to do XPath, and it is much simpler than either of the XPath transforms. E.g. the XPath Filter 1 Transform: ancestor-or-self::bar:Something and (count(parent::node()/namespace::*) = count(parent::node()/namespace::* | self::node())) –Nodeset has been removed. Nodesets are not only expensive, they are notoriously tricky to implement. There are some complex test vectors that almost no implementation supports. 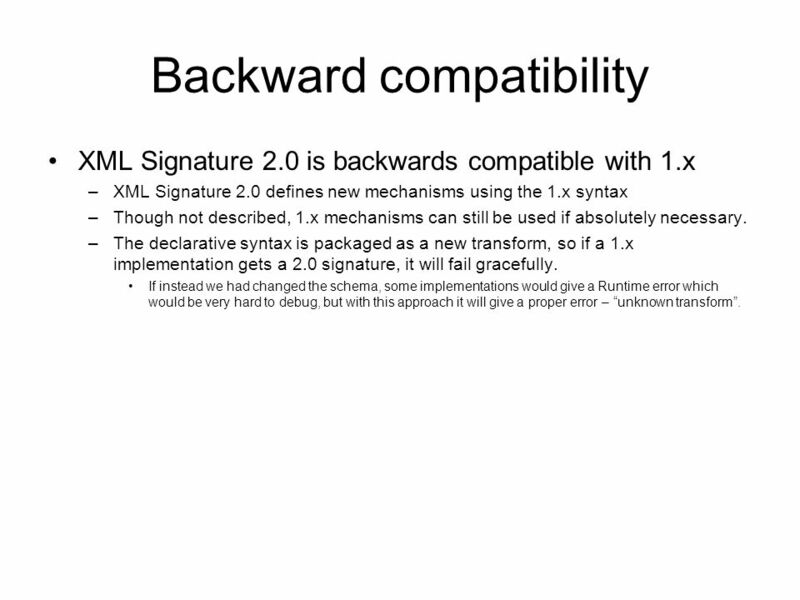 15 Backward compatibility XML Signature 2.0 is backwards compatible with 1.x –XML Signature 2.0 defines new mechanisms using the 1.x syntax –Though not described, 1.x mechanisms can still be used if absolutely necessary. –The declarative syntax is packaged as a new transform, so if a 1.x implementation gets a 2.0 signature, it will fail gracefully. If instead we had changed the schema, some implementations would give a Runtime error which would be very hard to debug, but with this approach it will give a proper error – unknown transform. 16 Summary XML Signature 2.0 offers many improvements, including simplicity, performance, streamability, and reduced attack surface. 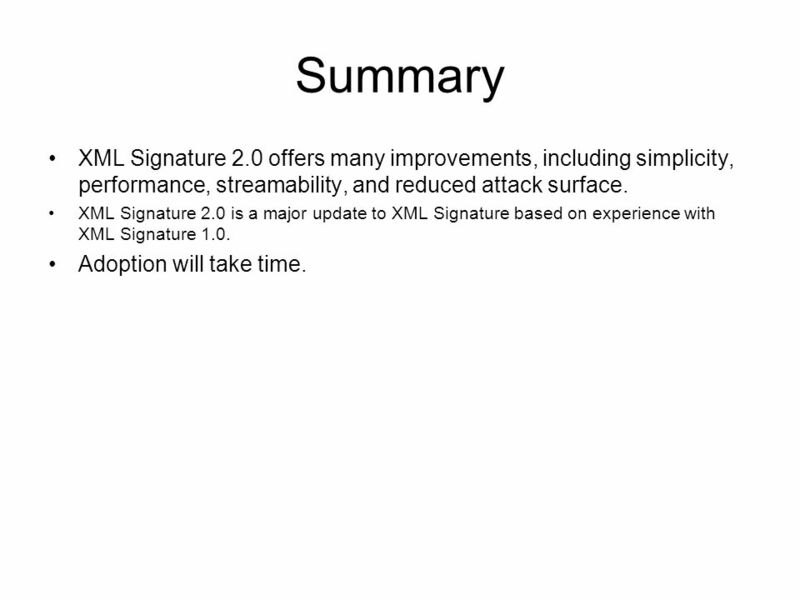 XML Signature 2.0 is a major update to XML Signature based on experience with XML Signature 1.0. Adoption will take time. Download ppt "XML Signature 2.0. Timelines 2002 – XML Signature 1.0 2007 – XML Signature 1.0, 2 nd edition –Adds support for Canonicalization 2009 end – XML Signature." XML Signature 2.0. Timelines 2002 – XML Signature – XML Signature 1.0, 2 nd edition –Adds support for Canonicalization 2009 end – XML Signature. Experience with XML Signature and Recommendations for future Development Prateek Mishra, Sep, 2007. XML Introduction What is XML –XML is the eXtensible Markup Language –Became a W3C Recommendation in 1998 –Tag-based syntax, like HTML –You get to make. What is XML?  XML stands for EXtensible Markup Language  XML is a markup language much like HTML  XML was designed to carry data, not to display data.